Cordiant tyres: high-tech, multi-layer and durable design. The tread is a wear part of the tyre that comes into contact with the road. It is made of wear resistant rubber showing excellent grip characteristics on any road surfaces. The undertread protects the steel cord breaker from damage. It is made of the rubber compound ensuring enhanced tyre controllability and lower fuel consumption. Studdable tyres are made of a rubber compound, which ensures higher stud retention reliability. The two steel cord layers and the fabric cap ply with spiral winding ensure the tyre strength and reliability, puncture resistance, controllability, shape stability, operational safety and speed endurance. The carcass is made of polyester cord with lower elongation and enhanced strength, which ensures stable tyre dimensions, effective vibration absorption, shock stress reduction and operational reliability. The squeegee and the inner liner increase the tyre uniformity at shaping stage, ensure the impermeability of tubeless tyres and prevent the carcass rubber from being pressed out. 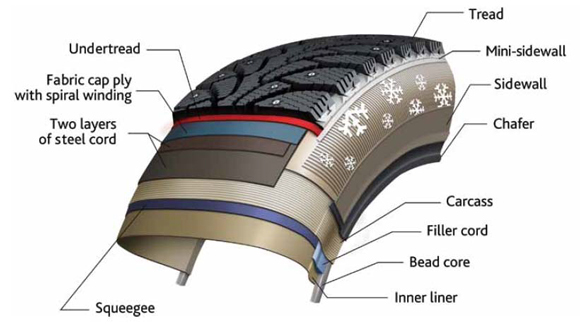 The bead core, which is made of high-strength wire, and the filler cord, which is made of rubber with increased hardness and strength properties, ensure the tyre tight fit on the rim and the smooth transition from the hard rim to the elastic sidewall, as well as provides for better controllability and increased safety. The chafer, which contacts the rim, ensures better wear resistance and protects the tyre from mechanical damage, increasing the tyre controllability. The sidewall and the mini-sidewall are made of elastic rubber compound with increased mechanical damage and ozone aging resistance. The mini- sidewall ensures better tyre controllability in the process of turning and maneuvering, which is achieved due to smoother hardness change in the area of the sidewall/tread cap transition.